Things didn't end so well for Team KEG's 2007 Kickball Championship quest. The tourney was this past weekend and before hand I was pretty jazzed to be playing again. For the first time in several weeks we actually had a full roster(1) and it included several players who had been out for a few weeks. That anticipation damped about an hour before the opening pitch when we found out that 4 of our teammates had cancelled. This meant that we were only going to be able field seven - which is less than a softball team or even a little league baseball team. We asked league officials about playing with our small number and they said it was fine but "good luck". By the time that the other team - the "Grass Kickers" - arrived they, too, had cancellations. I overheard them scrounging for subs and told them about our shortage and we agreed to equitable play. Unfortunately, for us, their subs started arriving and within an inning or so we were playing 7 on 10(2). After much strategizing, we wound up playing two outfielders in left and right, first- and third-basemen in front of them, myself behind behind second base, Hope and pitcher and Keri, our usual catcher, next to Hope as a utility infielder/shallow short stop. Other than the obvious lack of a center fielder, you've most likely noticed we played without a catcher. This may be a first in organized kickball. In my opinion, it's akin to pulling your goalie in crisis time of a hockey game, only we had to do it for an entire game. The first couple innings went well with our typically stout defense not really affected by the lack of field coverage. We were even able to score a few runs on offense which had really been missing from our games the last few weeks. About the third inning things started to go horribly awry as the were able exploit our lack of players(3). Not to mention they also kicked what may have been the longest kick I've ever seen in my life. However, in the top of the sixth we had a little spark on offense and started to gain some ground on what had been a 2-11 deficit. We scored five runs which is tough to do with seven players - you're pretty much either up to bat, on base or coaching a base. In the bottom of the sixth, we held them with three straight outs. We were excited to make up the remaining runs in the top of the seventh and continue on to round two of the tourney, but, alas, it wasn't meant to be: three straight outs and our season's over. All said and done, it was most likely our best played game (especially considering our shortage of players) and probably the most fun, too. In fact, it was just fun enough to bring us all back next year. (1) 11 players (2) To add insult to injury they even added an 11th player in the sixth inning. (3) They were also helped by an umpire who was so disinterested in the game that he never noticed both teams standing their watching him as he asked some girl if he should wear his Colts speedo to a party that weekend. I told him yes. After three consecutive weeks of rainouts we finally had opening day for the Circle City Athletics 2007 Kickball season a little over a week ago. It was quite the spectacle and included a parade with Payton Manning as Grand Marshall, fireworks over the White River and an opening pitch rolled out by Indianapolis Mayor Bart Peterson (1). I’ll keep the play-by-play short, but we went down a run early and that lasted most of the game. We came back in the seventh (and last) inning as I took advantage of an error by the right field to come home for the tie. After a twenty minute break for our official (3) to ask the league if we had enough time to play extra innings, we resumed the game and held our opponents for two innings. In the bottom of the ninth we were able to reel in the “W”. Hope and I missed the game last week (4) to attend a retreat with our small group from church and unfortunately Team KEG dropped a close one. It prompted a call for “practice” (5) which is something we’ve done our best to avoid. 1. None of this happened. 2. I like to refer to him as the “Gym Class Hero” 3. He was completely ridiculous, I think he believed he was calling a World Series game, not a beer-league kickball get together. (4)And the NFL draft, eck. 5. This may or may not happen. So, for a little recreation this summer Hope and I joined a kickball league in Broad Ripple Park. 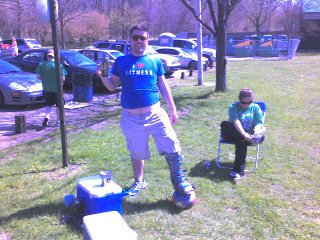 Yep, kickball. None of us had played since elementary school but we've had a fun time figuring it out. We had two games in April and dropped them both by one run. I missed the game last weekend when I was back in Cedar Rapids for the NFL Draft party but the team won 3-0. Apparently my skills as a shortstop were not missed. This weekend was our best game so far. We won 12-2. We held them to nothing for the top of the first and then I was the first run in in the botton of the inning. In the second through sixth we piled on the runs. I had two RBI's (r-k-i's?) and was left on once. The three at-bats where I got on base were singles (I don't have wheels, so much). In the last one, I got a bit cocky. Hope kicked after me and she got a single. They tried to throw me out at second and missed so I went for third. The ball was in left field and I watched the left fielder grab it so I tried to speed up a notch (once again, no wheels) to beat the throw to bag. Our third base coach didn't give me a signal so I turned to look for the ball. The left fielder had it and was ready to throw. I figured I had it made and then I thought to myself "he's going to throw at me". I beared down and next thing I know the big red ball bounced of my shoulder. I thought "he did throw at me!" and I was out. Ouch, that's a bit embarassing. The other team was still scoreless heading into their last side. They got a run from us and then we got two outs. With runners on first and second I got the ball and decided to make up for getting thrown out earlier by tagging the girl running to third. Not so much, I threw it and missed over her right shoulder. The third basemen and I ran after it (no fences in this league) grabbed it to stop the other runner on third, however the girl I missed made it home. It wasn't my best game but its a great time. If we keep on this winning streak, maybe we'll push for the national title.